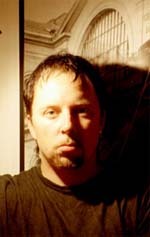 My name is Pasi Jддskelдinen. I was born 1966 in Jyvдskylд, which is a small Central Finnish city. I still live here with my wife and my son. I am a Finnish teacher in high school. My first (and so far my only) book was published in August 2000 by Tampereen Science Fiction Seura (Tampere's Science Fiction Society). 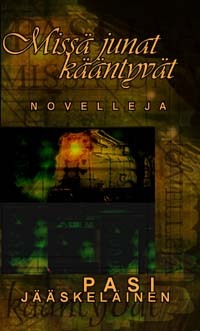 It is a short story collection called "Missд junat kддntyvдt" (in English it would be "Where the Trains Turn Around"). However, one could say that my stories are rather novellettes than short stories. Atorox-prize (for the best Finnish science fiction or fantasy short story): years 1998, 1999 and 2000. 1st prize in Portti's (a sf-magazine published by Tampere's Science Fiction Society) annual short story contest: years 1995, 1996, 1997 and 1999. 2nd prize in Portti's annual short story contest: years 1991 and 1998. I do not write traditional science fiction or fantasy. There are no rockets, starships, strange planets or rayguns in my stories. I do not pay much attention to "science" in science fiction. I rather dream about long, silent trains and ordinary-looking librarians with small breasts and brown hair. But sometimes my trains wake up from their sleep and jump off the rails and off their own time, in a secret magical place where the trains turn around - and of course this is discovered (and perhaps even created) by a young boy called Rupert. And my little librarian, Alice Boumgarden, lives seven different lives at the same time - and one morning, with her lover, she remembers them all. Of course my stories are science fiction, or speculative fiction. They also are detective stories (in one of my stories God did it, not a butler), love stories and horror stories.